°Consumer Confidence Index numbers haven’t been this high prior to a holiday shopping season in 18 years, according to the Conference Board. In this context of high-buying intentions, my location marketing firm Reveal Mobile surveyed 260 small- to medium-business owners and managers to see how they planned to allocate resources to maximize this 2018 holiday shopping season's potential. 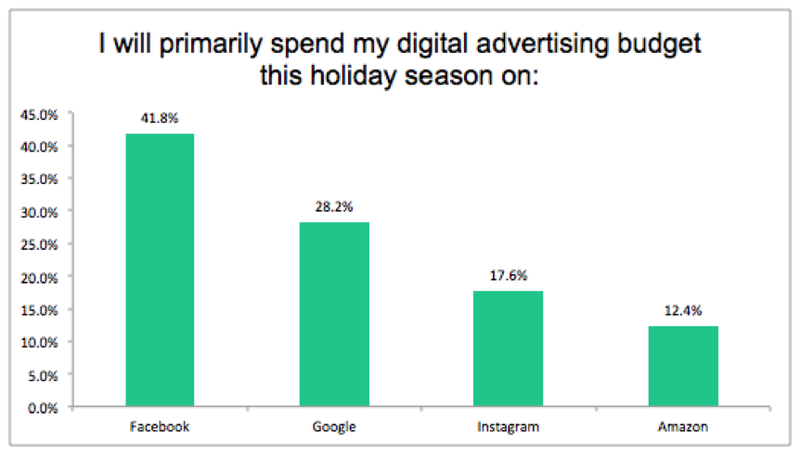 Social media will be the winner of holiday ad spend. ° Over 36 percent of respondents indicated that social media marketing would be the priority for their ad budget this season. ° Creating and executing campaigns and finding targeting audiences has become increasingly simple on Facebook and Instagram, and our research reflected this trend. Digital ads will overpower traditional ones -- by a large margin. ° 68 percent of holiday spend among businesses surveyed will go toward digital channels like search engine marketing, digital display ads, Amazon and the aforementioned social media marketing. ° Leading traditional channels indicated in the survey included TV advertising (15 percent), print (14 percent) and radio (3 percent). ° Business owners and their marketing teams will frequently be incorporating geotargeting into their holiday campaigns. 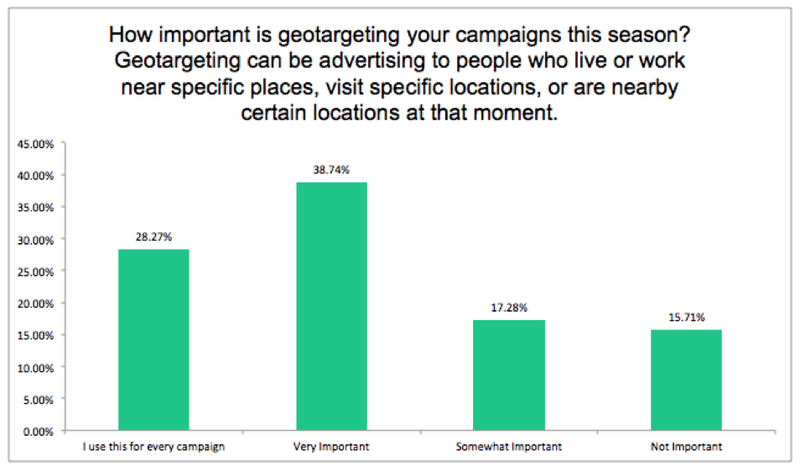 84 percent of advertisers acknowledged location-based marketing would have greater importance in their campaigns this season. 28 percent of respondents said they would use this tool in every campaign during the holidays, meaning that many marketers will reach consumers by developing target audiences. Of the digital advertising channels, marketers said they preferred Facebook. ° Facebook was selected by 42 percent of the SMBs surveyed as their primary digital channel for ad spend. This is a very high percentage, considering the backlash and decreased user activity we’ve seen with Facebook this year. However, Facebook’s excellent ease of use and ability to incorporate third-party target audiences kept it as our surveyed SMBs' No. 1 choice. ° Facebook was followed by Google (28 percent) and Instagram (18 percent), with Amazon at 12 percent. Given that Instagram is owned by Facebook, 59 percent of SMBs said that the two platforms would get the majority of their digital ad spend. ° Marketers tend to increase their ad budget during the holidays, but not as often as you might expect. 37 percent of entrepreneurs surveyed indicated that they boost their ad spend during the holidays, but 30 percent said their ad budgets stay the same. 8 percent actually stated that their advertising budgets decrease during the holiday season. Black Friday and Cyber Monday remain important to entrepreneurs. ° 21 percent of respondents said they allocate their holiday ad spend primarily to reach Black Friday shoppers, while 19 percent indicated they do the same for Cyber Monday. The implication was that the majority of SMB advertisers choose to win consumers over the holiday season, not on a single promotion. ° Business owners might contribute to a strong quarterly performance for Facebook and Google. ° Startups also have the option to take advantage of Instagram’s video advertising capabilities. Check out how the app Hopper utilized a video ad to drive customer growth, as well as 36 other Instagram ad campaign examples here. While Facebook and Instagram have powerful audience targeting features, they also allow advertisers to create custom audiences from other data sources. These can be their own customer data, or opt-in data sources from third parties. The use of custom audiences also has become important since Facebook announced its elimination of “partner categories,” which officially went into effect on October 1. That program allows the use of audience segments from third parties, integrated directly into Facebook. The loss of this capability means that advertisers now heavily rely on custom audiences. Entrepreneurs selling products and services directly to consumers should feel comfortable not only using social media for advertising, but also taking advantage of all of the targeting tools available on each platform. As a result, these companies can significantly increase the efficiency of their advertising budget by reaching only those who are most likely to convert this holiday season. Many business to business (B2B) entrepreneurs should also give consideration to digital advertising as an effective channel. By using Instagram and Facebook’s geotargeting, demographics and custom audience features, it is possible to reach a desired market segment. B2B ads will also stand out among the stream of consumer focused products in their feed. While not every company will be a fit, and our survey results won’t apply to everyone, there is a clear business case to be made for entrepreneurs to advertise on social media and combine it with geotargeting as the best route to reach their target audience this holiday season.